Hi everyone. Today I'm playing along with the first challenge of the year at Merry Monday (#271 - Embossing). The challenge is being run by my dear friend Linda. This holly is die-cut from hot press watercolour paper and watercoloured with distress inks. A few details have been added with distress markers (veins in the leaves, outlining the berries). I tried to leave a white spot on each berry, but somehow I managed to watercolour completely over top of a couple, so used a white gel pen to add the spots of white afterwards. Happy with how it turned out. I also diluted white acrylic paint to splatter over top to create the look of snow. For the final touch, I stamped my black sentiment banner with white pigment ink and heat embossed with white embossing powder. For the second card, it is mostly the same except I switched out the dry embossed background for falling snow, and used watercolour pencils to add details to my holly and berries. The watercolour pencils give a subtle look and blend better than the distress markers. Learned something new, which is always good. Two beauties with that holly, Loll - just love your coloring & those yummy embossed backgrounds! Thanks for joining us at Merry Monday!! Wow, Loll, these are both so beautiful! Saw this in the pool at Merry Monday...the holly and berries just pop against the crisp, white backgrounds! I love both dry embossed backgrounds, too...I'm a big fan of dry embossed card bases, so these are really fabulous in my book! Gorgeous cards!! That holly branch looks stunning!! Both are fabulous - the holly looks great against the embossed backgrounds. And it's neat to see the difference between the Distress ink and the watercolour pencil watercolouring. 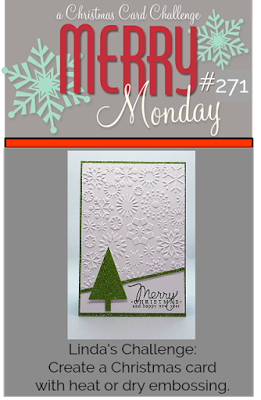 I'm using an embossing folder too for my Merry Monday card - need to remember to use them more often! You are an ARTIST! This is gorgeous, so realistic, it jumps right off the page! Beautiful! two beautiful cards to start off the collection of Christmas cards for 2018!! love both of them - the holly embossing on the first one is especially pretty! don't remember if i wished you a happy 2018 - have a great one!! We had a similar idea for this challenge, my friend. Hopefully I can get the photos edited and join in before the challenge ends! Love this holly and how you've colored it! The white dots and splatter look fantastic! WOW! Talk about some incredibly beautiful watercoloring! These both are amazing and your painting stole the show! The berries are gorgeous with your highlighting too. I did get a bit of a giggle when you tried to leave white space. Don't think I've ever successfully left white space when watercoloring either. Your embossed backgrounds are the perfect backdrop for this exceptional artwork! Wow Loll, these are both outstanding. I can't pick a favorite because they are both perfectly gorgeous! Well done with the technique and I love your background on both!! Thank you for playing with us at Merry Monday!! Such lovely holly cards, both are beautiful. A wonderful and very 'fresh' looking card Loll - love the texture the embossing adds. Both cards are simple and so so stunning in their own right Loll. Love the splatters and the white gel spots - adds so much interest. Looking forward to seeing the Twofer Team's designs soon. Darnell has certainly picked a talented lot. Both cards look fantastic, Loll! I do really like the texture dry embossing adds. The holly leaves are such a pretty color! Thanks for sharing! This is another exceptionally beautiful cards, Loll! I stuttered when I saw her. Great vibrant colors. I love the embossed background that beautifully displays the twig of holly. Black bangle with fondness fits the whole perfectly. And I love white splatter on holly. Everything together is simply stunning !!! Beautiful card, the holly looks wonderful again the textured background. Thank you for joining us for Merry Monday. Two stunning cards Loll! Love the holly leaves and berries die. I may have to add that one to my cart on my next shopping trip. ;0) Thanks for enabling me my friend! A really impressive card with the embossed background. Hugs Mrs A. (ValeryAnne). Loll, this is so gorgeous. Love your holly leaves on the beautiful embossed background. Thanks for joining my first challenge this week at Merry Monday. That holly is amazing, Loll, especially the berries that have so much dimension. Your snow spatters look wonderful. Mine always seem to disappear into the card. Wow. So striking. The embossed background is so pretty behind your stunning holly. Love this, Loll. Stunning Christmas cards Loll, lovely embossing folders and your sprigs of holly are gorgeous. Thanks for playing at Merry Monday this week. These are so beautiful. I had to pin both of them. Thank you for sharing the details. This is so bright and pretty popped up on the pretty white background.